Our mobile Service vans and trade counter carry all sizes, types and working pressures of hydraulic hoses and fittings, compatible with petroleum, water, steam and synthetic based fluids for mobile equipment, lube line, blow-out prevention, hydraulic lifts and construction machinery. Our on-site repairs services are available throughout Northern Ireland and our trade counter is open from 8am – 5.30pm Monday – Friday at our service center on situated in Mallusk, Belfast. 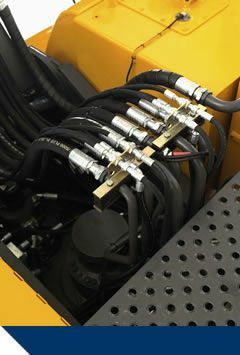 Contact Plant Hoses to enquire about our fantastic hydraulic hose fitting and repair services.